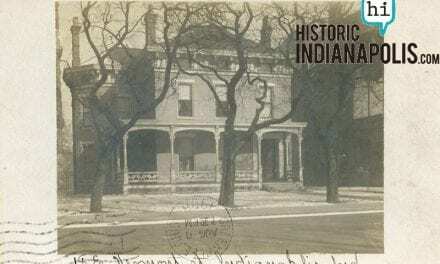 One of Indianapolis’ big claims to fame is that Abraham Lincoln slept here. 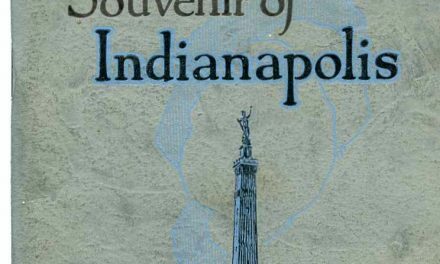 On the eve of his 52nd birthday, and on his way to be sworn in as the 16th president of the United States in Washington, D. C., Indianapolis was the last of six Indiana stops on February 11, 1861. After departing from Springfield, Illinois that morning, Lincoln stopped in three other Illinois train stations before Indiana, where he stopped in State Line City, Lafayette, Thorntown, Lebanon, Zionsville, and finally Indianapolis. Near the very spot those words were uttered by the man himself, you will find the familiar black metal historical marker, as you may find sprinkled throughout the state of Indiana. After sharing the aforementioned oratory, Lincoln joined Governor Morton and a procession of thousands, headed for the corner of Illinois and Washington streets. In the shuffle of the bustle and crowd, Lincoln’s son Robert had to carry some of the party’s luggage, we he tossed behind the desk after arriving at the Bates. When the president-elect arrived, he realized he did not have his black bag–a crucial piece of luggage, as it held his soon-to-be-delivered inauguration speech. Robert found it where it had been discarded, albeit under a pile of other suitcases, and the briefly lost speech was found. He slept at the Bates that night, before continuing his journey towards Washington, D. C. the following day. 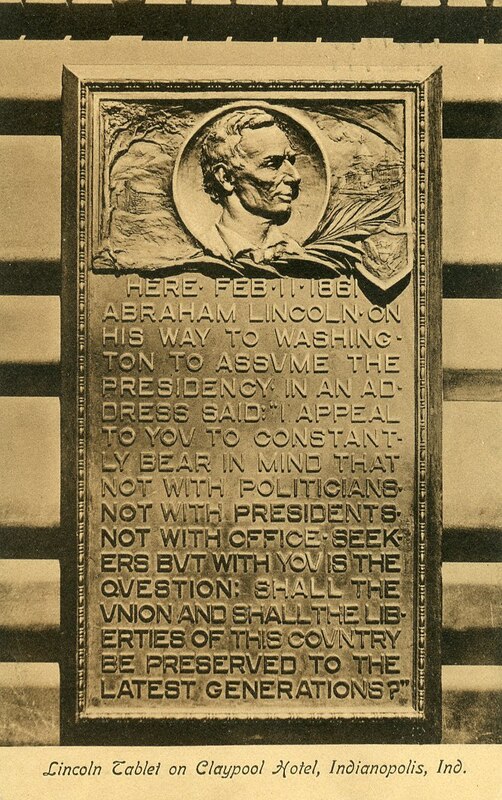 Fast forward to 1906, when the Commercial Club created a contest for local 8th grade and high school students, asking “What historic spot in Indianapolis should be commemorated with a tablet and why?” More than 200 essays were submitted, with the majority of students asserting that Lincoln’s Bates balcony speech deserved the honor. The committee agreed with that conclusion, and then issued an additional contest to the art students of Shortridge and Manual High Schools. Each of the 22 entries were assigned a number, to guard the identity of the artist, to prevent any prejudice for or against a particular student. The students who competed against the winning artist were: Ray O. Haver, Alma Gruman, Bloor Schleppy, Cecil Crabb, Jennie Lallahan, Tirbie Stewart, Edith Hatton, Geneva Martin and Former Lammon and Albert Schearer–all Shortridge students. The Manual Training High School finalists were: Elnora Balz, Helen Ensey, Orpha McLaughlin, Julia Mercer, Mabel Overhiser, Maud Parker, Frances Pennington, Harold Sexsmith, Margaret Shover, Margaret Stark and Suzanne Stark. The winner was chosen by members of a Commercial Club committee and T. C. Steele, artist; Bernard Vonnegut, architect; Rudolf Schwartz, sculptor; and W. H. Fox, director of the John Herron Art Institute. 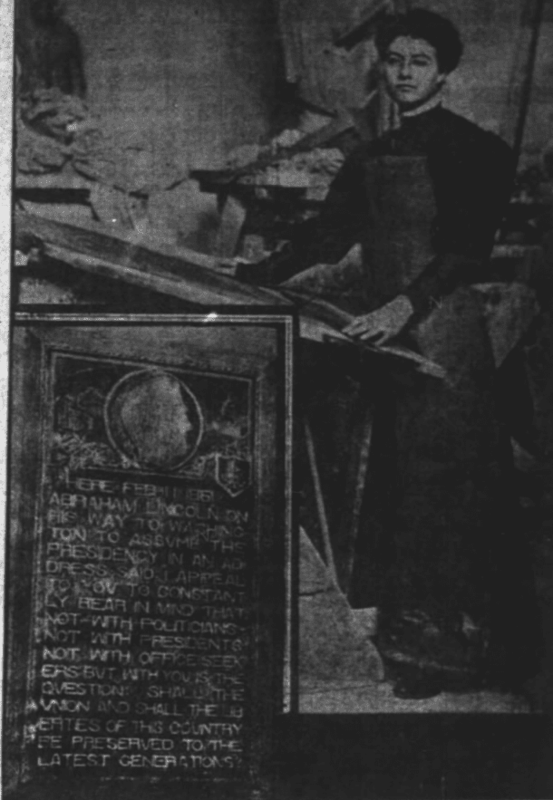 Marie Stewart, an art student from Shortridge was unanimously chosen by the committee, and in December 1906, a show of all the proposed designs was displayed at the John Herron Art Institute in one of the galleries. The final design was finessed and fabricated by sculptor, Rudolf Schwarz, and if you google his name, this tablet is among the results. Not so for the designer, Marie Stewart, who we will feature in March, during Women’s History Month. 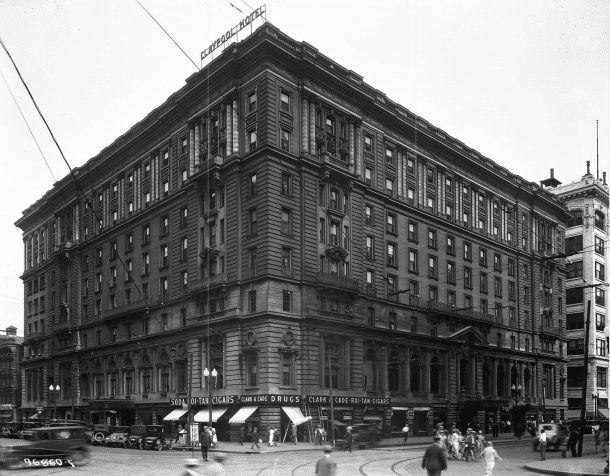 On February 12, 1907, crowds gathered at the corner of Washington and Illinois streets, for the unveiling of the new tablet. 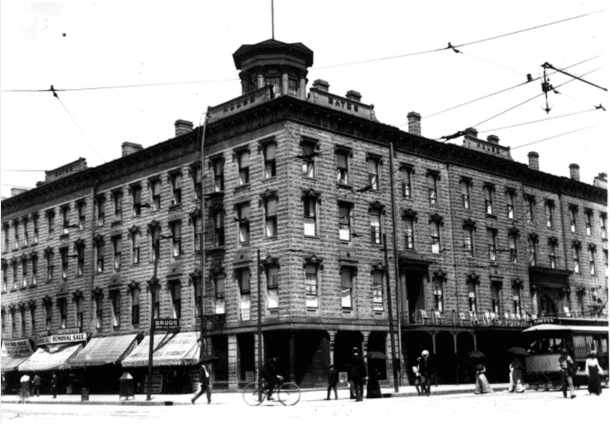 Because the Bates House Hotel had been replaced in 1903, the bronze tablet was affixed to its successor, the Claypool Hotel, on the south facade at street level. Noteworthy that Lincoln reportedly spoke from a balcony on the south side, yet photos of the Bates show more prominent balconies on the east facade. Also, the words selected to use on the marker were not spoken from the Bates balcony, but uttered down the street at Washington and Missouri streets, as earlier stated. Lincoln is looking East towards Washington, D. C. All that aside, the placement and unveiling proceeded after speeches from J. E. Hollett, Manager of Ceremonies, and Governor Hanly. The reverie and reverence continued with other speeches, music and programming at Tomlinson Hall that evening. 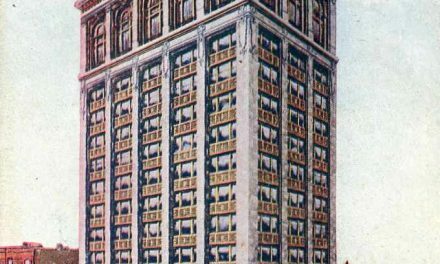 From that February day in 1907 until the hotel was preparing to be razed in 1969, the tablet remained near the corner of Illinois, affixed to the Claypool. In June 1969, Robert Braun, the President of the Marion County Historical Society, said the sign was in the custody of the Federal Sign and Signal Company at 725 North Capitol, storing it for future use. 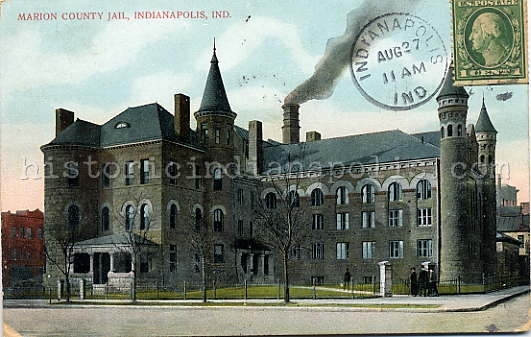 Indiana Historical Society, P0569. 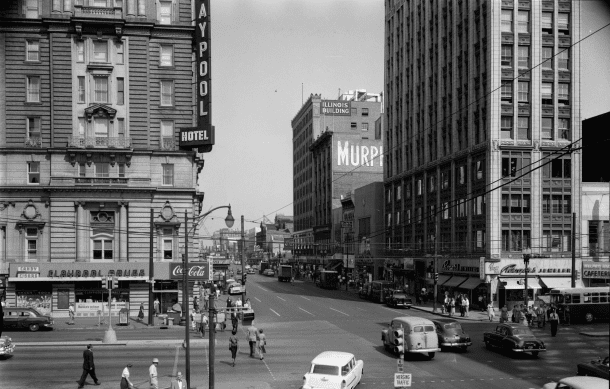 A 1955 image of the Claypool Hotel shows the tablet affixed to the structure at street level, slightly left of the traffic signal. 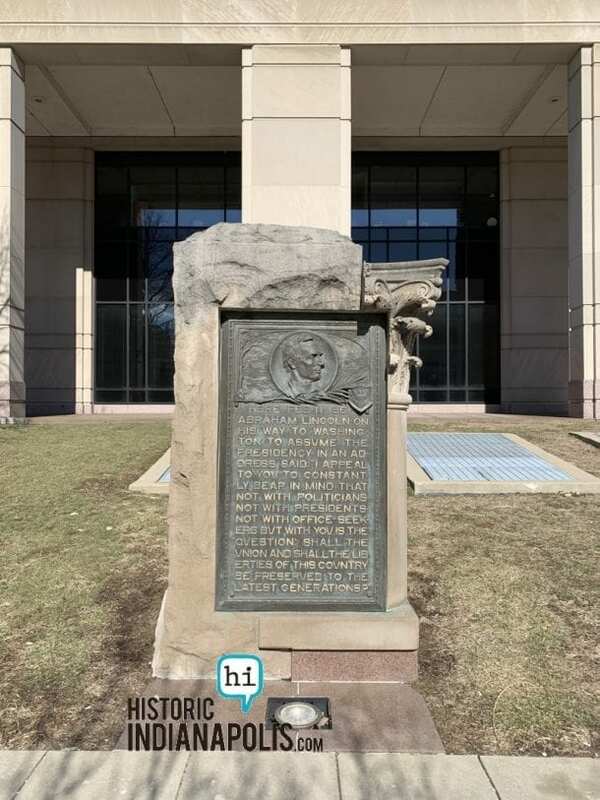 The “Claypool” Lincoln marker now stands a few feet behind and to the east of the distinctive black Indiana State Bureau marker in a free standing encasement; its exact placement is curious. Evidently, it was about a half a block further east of where it now stands in the early 1980s. The intersection of Missouri and Washington is not so heavily trafficked as is its former location at Washington and Illinois streets. 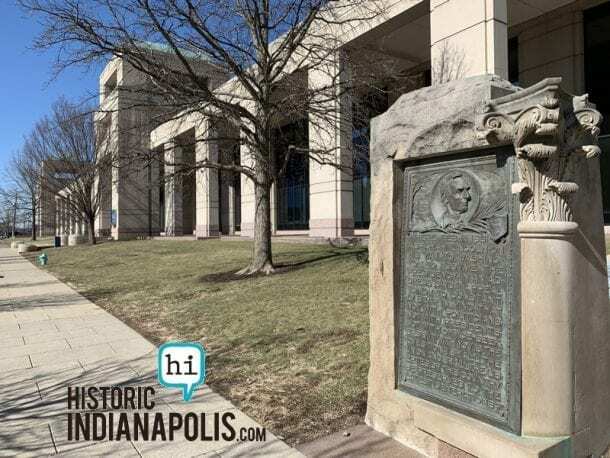 Unfortunately, few people now realize, as they pass the nondescript Claypool Court building, the significant Indianapolis event that once occurred on that corner. Should You Get a Souvenir?